19th Century Charm, 21st Century Style from HeadsUp Design! When we first set eyes on these farm-themed cuckoo clocks, we knew immediately that these were something special - they look fantastic when you open the package and work wonderfully when put up on the wall. On the hour a cow, sheep, or chicken character emerges from the clock and sounds automatically with one "Moo", "Baaa", or "Bawk" (as appropriate). They also perform on command by pressing a button on the side of the clock. A photo-switch automatically shuts off the characters when the room becomes dark, so your child will not be woken up. They are all made of high-quality ABS plastic in vibrant and attractive colours, which gives them an expensive feel, unlike many other childrens plastic toys. These clocks are large enough to make a great impact in the kitchen, or in a child's bedroom or nursery - dimensions 31x25x10cm (12x9x4 inches), pendulum length 19cm (7 inches). 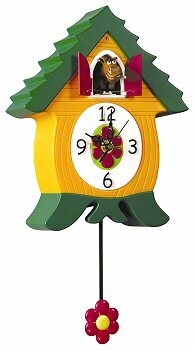 Cuckoo clocks with a delightful twist. On the hour, a wacky farm or jungle character pops out of the doors and sounds with a Moo, Neigh, Bawk, etc. These funny clocks are ideal as children's clocks or for young at heart adults. Coo clocks are usable as wall clocks or mantle clocks. "Neigh"! On the hour our wacky horse gallops up and leaps through the doors with a hilarious neigh. The WhinnyCoo horse clock comes in a orange housing with a swinging red pendulum. For nighttime a light sensor automatically shuts off the character when the room becomes dark. For encore performances there is a button on the side. Coo clocks are made from quality plastic and require 3 D and 1 AA batteries (not included). Dimensions: 12" x 9" x 4".